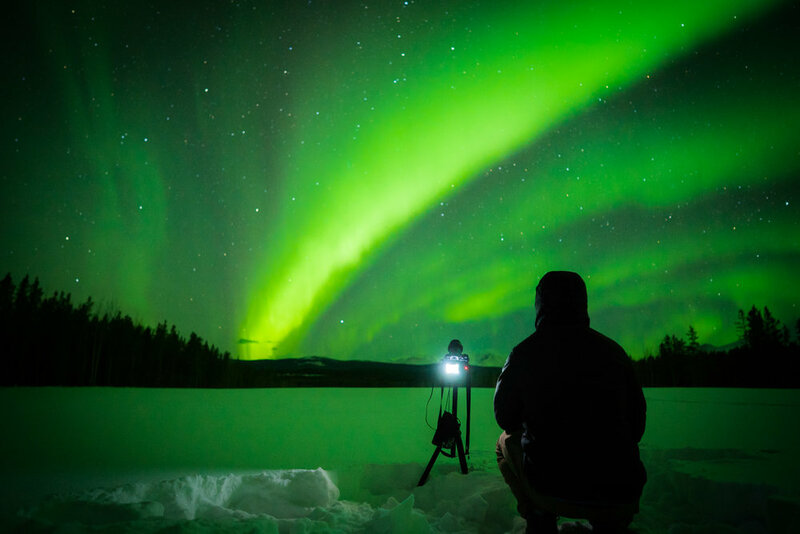 What: A trip to Whitehorse, Yukon to chase the auroras. To make the trip seamless, we’ve taken care of all the major details. Kick back, relax, and focus on enjoying the trip. Roundtrip airfare from Vancouver (if you're not coming from Vancouver, please select that package). Airport transfers from the Whitehorse airport to the Takhini Hostel & Hotsprings. 3 nights shared accommodation at the Takhini Hotsprings Hostel, 30 minutes outside Whitehorse. All-weekend-long access to into the Takhini Hotsprings including two private night rentals, just for us and the auroras. Breakfast, lunch, and dinner provided all weekend by our private chef, Kyle Friesen. Workshops focused on personal development and connection. 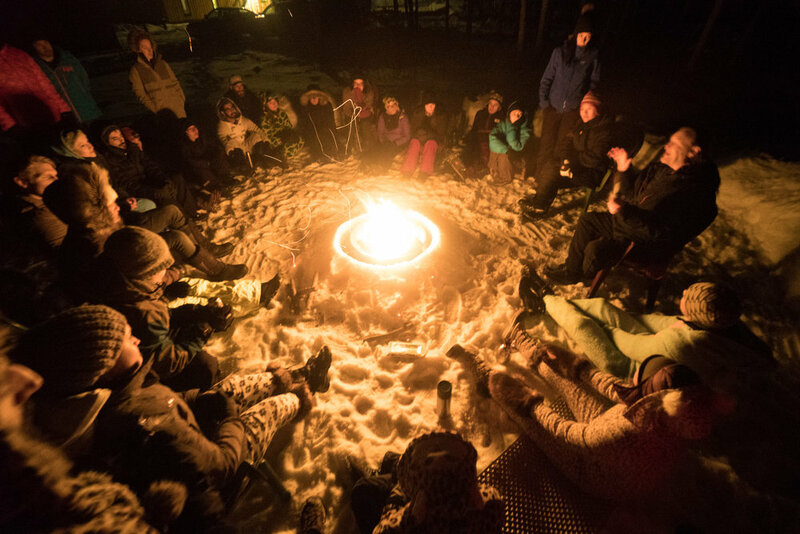 Fireside RealTalks to dive into the real side of life. Genuine Yukon experiences including access into the Yukon Wildlife Preserve and a snowy sunrise hike. Free-Time/Chill-Time to experience other Yukon activities including dog sledding, ice climbing, and heli-tours – or just to chill out and relax. The cost of optional free-time activities on Saturday and Sunday – such as ice climbing and dog sledding. Transportation to and from YVR Airport . You can find a detailed trip timeline here. Taking off from Vancouver, you’ll be flying over the white-topped peaks of the Coast Mountain range and landing in Whitehorse around 1PM. As you fly in, you’ll get to the see just why they call it the Great White North. 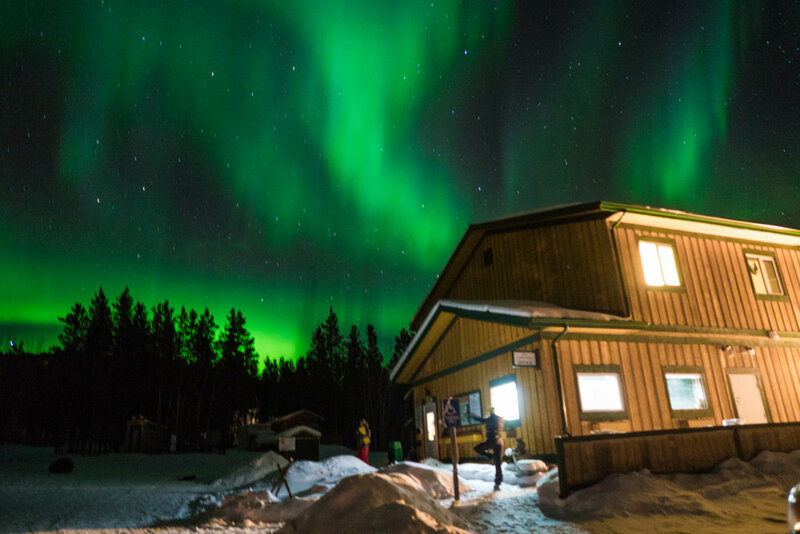 Before we head out to the Takhini Hot Springs and Hostel, located ~30 minutes outside of Whitehorse, you’ll be taken on a tour of Whitehorse and get the chance to see what this little gem is all about. Located ~30 minutes outside of Whitehorse, you’ll be staying at the Takhini Hot Springs and Hostel. Getting away from the city limits helps limit light pollution and gives us a darker sky. All this means a better shot at catching the auroras. After getting checked in, you’ll have free time to hang out with the crew, explore the surrounding area, go chill in the hot springs, or play outside. The trip will kick off with a Group Welcome Dinner. The dinner will include a trip intention setting session and an opportunity to get to know the crew. 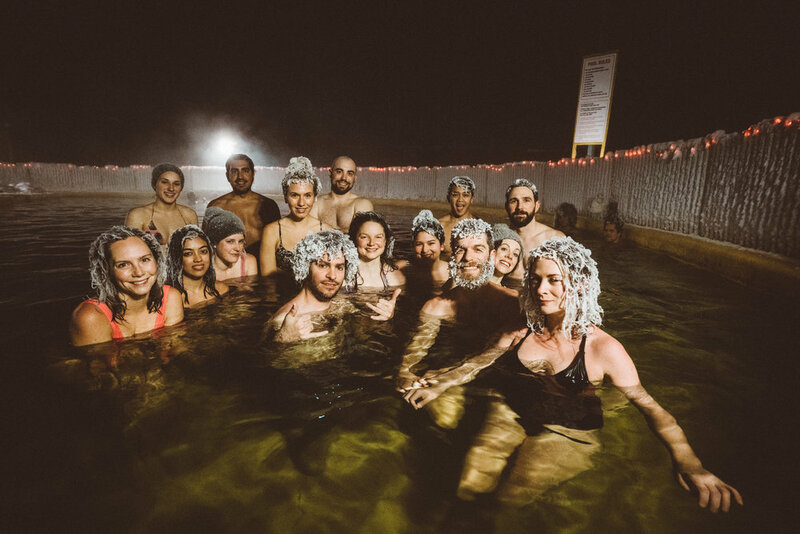 On Friday and Saturday night, we will be renting out the entire Takhini Hot Springs for a private, after-hours session, just for our crew. 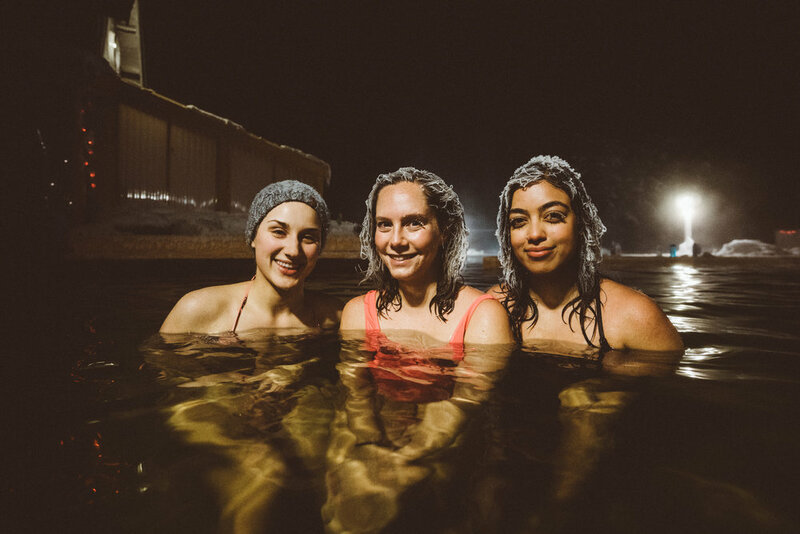 Hang out in the hot pools, roll around in the snow, jam to some good tunes, check out the stars, and if we’re lucky, look up and watch the auroras. If Mother Nature decides to give us a show and the auroras are going off, you can bet we’ll be staying up all night chasing them. Start the morning off with some chill time, a morning meditation, or some zen morning yoga. 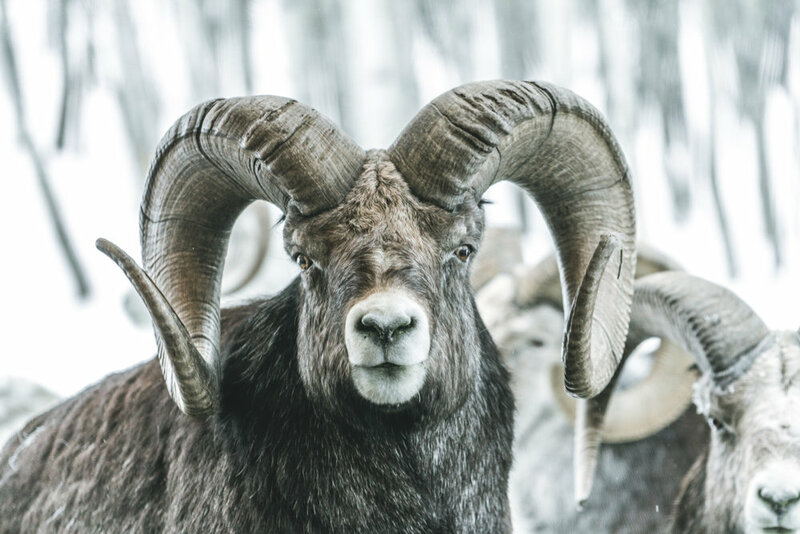 We will spend the morning checking out the 700+ acre Yukon Wildlife Preserve featuring 11+ species of northern Canadian mammals in their natural environment, including woodland caribou, Canada lynx, Rocky Mountain elk, mountain goats, Alaska Yukon moose, mule deer, muskoxen, wood bison, two varieties of thinhorn sheep (Dall's sheep and stone sheep), red foxes and arctic foxes. Each afternoon, we’ve included free time to explore other Yukon activities including learning about Yukon history and heritage, heli/plane flights over the Kluane Range, snowmobiling, dogsledding, ice climbing, downhill/cross-country skiing, snowshoeing, and day-trip exploring. Of course, if you want to use that time to unwind and chill in the hot springs, that’s totally cool. You’ll have all-weekend-long access to the nourishing waters of the Takhini Hot Springs. Hang out, soak it up, and come and go as you please, all weekend long. Throughout the weekend, you’ll be guided through a series of workshops focused on personal development, intention, and connection. And don’t worry, in true CS fashion, here won’t be any fluff. In true CS fashion, we’ll be kicking the morning off with a headlamp-lit hike to the top of a mountain overlooking the valley below. Mountain-top dance parties fully welcomed. And don’t worry, in true CS fashion, there won’t be any fluff. Pack up, say goodbye to the Great White North, fly home, and shed a tear that it's over. We’ll have you back in time for lunch. This trip was originally dreamed up by Amy Tanner in early 2018 and after how good the trips were, we couldn’t not bring it back to the community. 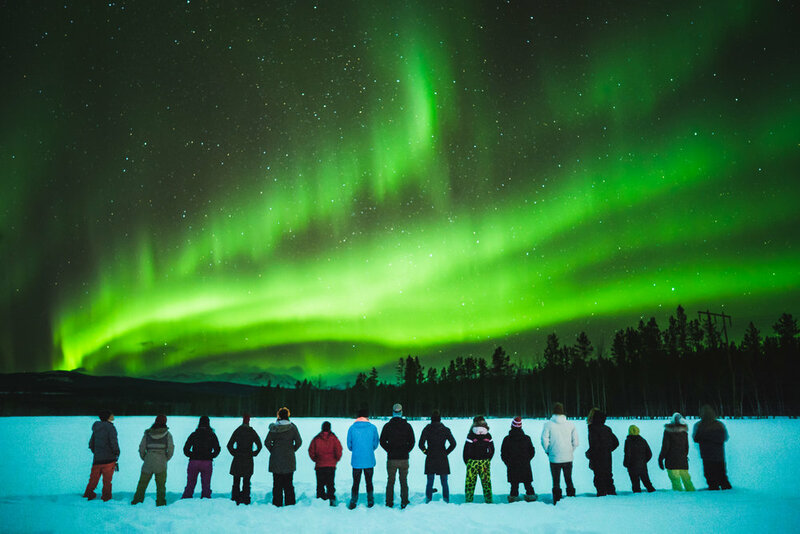 The people, the culture, the landscapes, the nature & wildlife, the experiences, and, of course, the chance to see one of nature’s craziest phenomena – the northern lights. All of this packed into a trip that leaves you with a whole different perspective on what the Great White North really is all about. To make your life easier and give you the maximum amount of time to explore and enjoy the Yukon, we’ve made the trip all-inclusive – covering your transport, food, lodging, and a number of daily experiences. It’s designed to give you a break from your day-to-day, refresh your stoke for adventure and life, and give you space to clear your head, re-connect with what matters to you, and meet a whole bunch of rad humans. Following our commitment to positively impact the place we go, we’ll be supporting local companies throughout the trip including a local transport and tour company Who What Where Tours, the Yukon-born Air North, and the privately-owned and managed Tahkini Hotsprings and Hostel – all of which have taken amazing care of us on previous trips. If you’ve been around CS long enough, you would have met our private chef, Kyle Friesen, who is our go-to for all things food. All weekend long he’ll be cooking up a feast for us and can accommodate vegetarian, paleo, vegan, and other dietary restrictions. On both Saturday and Sunday we’ve included ample free time to explore other Yukon-related activities including learning about Yukon history and heritage, heli/plane trip over the Kluane Range, snowmobiling, dogsledding, ice climbing, downhill/cross-country skiing, snowshoeing, and day-trip exploring. Of course, if you just want to use that time to unwind and chill in the hot springs, that’s totally cool. To make your life as easy as possible and give you the maximum amount of time to explore and enjoy the Yukon, we’ve made the trip all-inclusive, covering your transport, food, lodging, hot springs access, and a number of daily experiences. A payment plan of two equal payments of $825 is available. For those that need to plan a little more tightly. Pay In Full, Up Front ($1,600) – Pay for your trip, in full, up front and save $50. Pay In Deposit ($1,650) – A deposit of 50% ($825) is required to secure your spot, with the full balance due 30 days before the event. Failure to pay in full at the 30 day mark will release your spot back to the community and a full refund on the amount paid, minus a $500 deposit fee, will be refunded. See our full terms here. No refunds will be given 30 days before the event. A full refund less a $500 deposit fee will be given if we are notified more than 30 days before the event. Guests will be in shared accommodation rooms of up to five people. Accommodation will supply mattress, sheets, pillow, and a sleeping bag, however all guests are able to bring their own if they prefer. For room selection, we use a mix of asking you what you want (male only, female only, etc. ), pairing you with your friends, and a little randomness to make the rooms happen. As the trip unfolds, we will happily accommodate room changes if you need to switch it up, bunk with someone else, or just aren’t jiving with the people you’re currently bunked with. All travellers coming from a different city than Vancouver will be discounted the cost of airfare on the trip and be required to pay for their own airport transfers. Click here if you need to fly from a different city. It’s the chance of seeing auroras that drives us to make this journey. As is always the case with mother nature, there is a chance that we don’t see them. No refunds will be given if we do not see auroras. You can expect temperatures to between +5°C and -10°C. Our cancellation policy is in place to help guests and us alike work together in sharing expenses that may arise from unexpected cancellations. We strongly recommend purchasing trip cancellation & interruption insurance. A trip deposit of $500 of your total paid amount is non-refundable. Your trip deposit (minus $100 CAD re-listing fee) is transferable to another attendee. A full refund less a $500 deposit fee will be given prior to 30 days before the event. No refunds will be given within 30 days of the event. Your full balance is due 30 days before the event. Within 30 days of your trip, no refunds will be given. If it is possible, we will work with you to find someone to replace your spot. No one books a trip with the intention of cancelling it, but unexpected events do occur, so we strongly recommend purchasing trip cancellation & interruption insurance so that your trip fees will be covered should you have a medical problem prior to your trip or while on the trip. Know that it is your responsibility to read and understand our cancellation policy. Exceptions cannot be made for any reason, including weather, injury/illness, or personal emergencies. No refunds or credits for failure to attend or failure to complete the trip, or for arriving late or leaving early. We also recommend that you purchase your own travel insurance. Trip insurance should also be purchased to cover medical expenses in the event you have an accident while on the trip. Most travel insurance must be purchased within 14 days of making your reservation. We reserve the right to cancel trips with inadequate participant interest, in which case all money paid to Chasing Sunrise will be refunded. Notification of cancellation will occur at least 30 days prior to trip start date. Chasing Sunrise cannot be held responsible for any personal expenses, such as airline tickets due to changes in itineraries or trip cancellations.